Offer Details: This is a must visit place if you are a lover of Malbec and Sauvignon Blanc. Friendships form the foundation of AvinoDos, friendships that start over good wine. Our founder, Dan Dexter enjoys everything about wine, from working the earth to labeling bottles. But mostly he enjoys sharing wine with friends. That’s the fun part. When he seized the entrepreneurial spirit of the West and launched AvinoDos, two things became immediately clear: First, he needed to make good wine that was true to the essence of Napa Valley. Second, he wanted to create a winery that embodied the friendship that helped launch it. A winery where you can relax and experience wine, regardless of how much or how little you know about it. So, he created a winery that invites you to do more than just taste the Cabernet Sauvignon, Malbec, and Sauvignon Blanc. You’re invited to share the experiences and connect with the people who make it happen. You’re invited to join our wine club, where you can enjoy catered dinners, special offers, and other events. 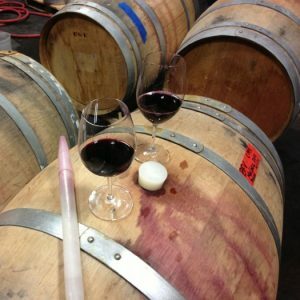 You’re invited to enjoy small, personal wine tours where you can taste wine still aging in the barrel. Come at the right time and you might be invited to pick grapes in the fields or roll up your sleeves and crush grapes to make wine. When you experience these things for yourself, you’ll understand what inspired Dan to uncork his ambitions and launch AvinoDos, or “wine from two.” Maybe you’ll even catch the entrepreneurial spirit. Hopefully, you’ll gain a greater appreciation for wine – and make a few new friends. AvinoDos Wines invites you to a private tasting of its current releases as well as barrel tastings of its yet to be released vintages. Our tastings are held at the winery with our Wine Master, Victor Orozco. Victor has worked in the wine appreciation field for over 40 years in many capacities including Sommelier and wine educator. On most days it is very likely that you will be involved with some aspect of our production as we are actively working on the wines while you are visiting!